Our March General Meeting will be held at the Kilmore Court House, 4 Powlett Street, on 3 March at 7:30 pm. Make sure to attend and hear from guest speaker, Susan Johns who will give a talk about Preserving Family History. Susan is a consultant on scrapbooking and paper craft. The meeting will end at approximately 9pm and be followed by supper. All members and non-members are welcome to attend. The Society has for sale a set of four postcards of scenes of ‘old’ Kilmore. These are available for sale at $2 each from the Society or the Kilmore Bookshop, and other local outlets. Kilmore Historical Society has expanded its online presence with a new Facebook Community Organisation page and Twitter account. So please make sure to ‘like’ us on Facebook and follow us on Twitter at @kilmorehistory. Harold was born at Kilmore on 1 June 1890, the son of Francis Walwyn Wortley and Elizabeth Ann Hammond. He attended Brighton Grammar School, where he joined the cadets. Harold then served in the 15th Battalion, Australian Light Horse for four years, reaching the rank of corporal. He listed his occupation as grocer and storekeeper of Kilmore. 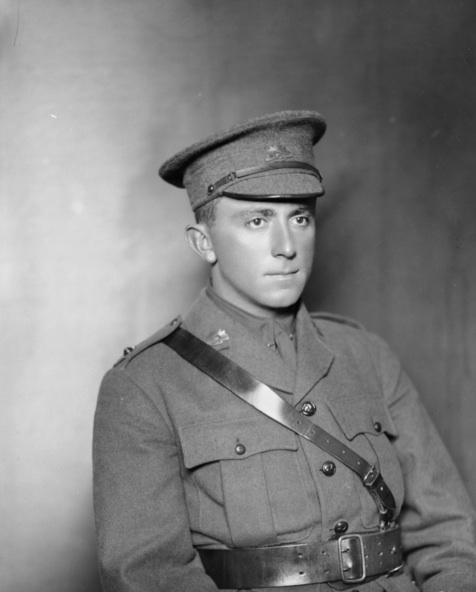 Harold volunteered for overseas service on 17 July 1915, promoted to sergeant and after attending Officer Training School and applied on 22 January 1916 for a commission in the AIF. His application was approved and he was appointed Second Lieutenant in the 7/29th Reinforcements on 6 March 1916. On 15 June 1916 he married Daisey Kathleen Keep at St Kilda. Harold embarked on 4 July 1916 in Melbourne on the HMAT Berrima bound for England. He proceeded to France on 9 November 1916 and after receiving a knee injury returned to England for treatment in April 1917. He returned to France in May 1917 but had recurring trouble with his knee and was posted for duty with the 8th Training Battalion. returned to England in June 1917, and posted back to 29th Battalion in France in February 1918. Harold became sick with mumps in May 1918 and returned to his Battalion in June 1918. Harold returned to Australia on the liner Port Melbourne arriving in Melbourne on 20 August 1919 and his appointment was terminated in Melbourne on 4 October 1919. He was awarded the 1914-1915 Star, the British War Medal and the Victory Medal. In early November 1919 Harold was appointed by the Kilmore Shire Council as Inspector of Nuisances. He served in World War 2 and died in Sydney on 25 July 1955. Harold is listed on the Kilmore Shire Honour Roll, Kilmore State School Honour Roll and the Kilmore Presbyterian Church Honour Roll. Patrick was born in Kilmore in 1874, the son of Michael Ahearn and Johanna Davern. He was a farmer when he enlisted, and married to Anastasia Josine Dunphy, with two children Julia and Michael. 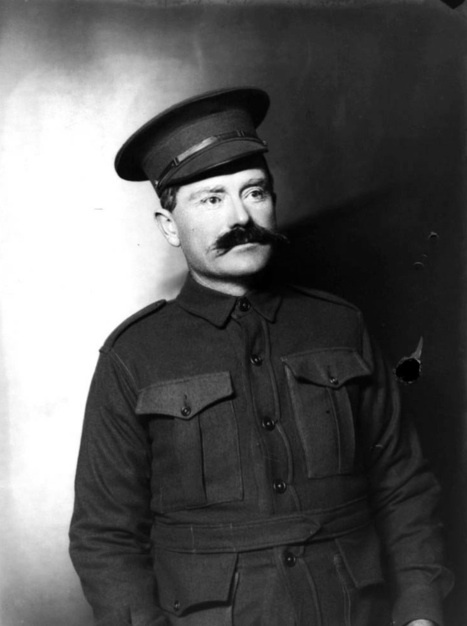 Patrick, aged 41 years, enlisted as a private at Kilmore on 11 June 1915 in the 14th Battalion AIF. He was 6 feet tall and weighed 182 pounds, and was declared fit for service on 12 June 1915. After training he embarked on HMAT Nestor on 2 October 1916 for England. Patrick saw service in France with the 14th Battalion from late December 1916 to February 1917 when he returned to England for treatment for bronchitis. After recovering Patrick again saw service in France from November 1917 to February 1918 when he returned to England with trench fever. Patrick returned to Australia on the SS Suevic in April 1918 and was discharged at Melbourne on 25 July 1918. Patrick was awarded the 1914-1915 Star, the British War Medal and the Victory Medal. Patrick returned to his family at Kilmore. He passed away on 15 June 1944 and was buried in the Kilmore Catholic Cemetery. Patrick is listed on the Kilmore Shire Honour Roll. Arthur (pictured below seated) was the eldest son of twelve of Denis James (Din) Harrington and his wife Amelia Margaret (Milly) Johnston. He was born in September 1895 at Tantaraboo. He first tried to enlist on 21 January 1916 in the 21st Battalion. He was a labourer aged 20 years and 3 months. Arthur and his friends Albert and Frederick Knight were given a rousing send off and a money belt each on 30 March 1916 at the Tantaraboo school room. The party did not break up until 4am. However, in April Arthur was assessed as medically unfit. Arthur next tried to enlist in July 1916 and was declared fit by Dr Semple of Kilmore and later by a second doctor in Melbourne. Arthur took his oath at Broadmeadows military camp on 20 July 1916 the date of his enlistment. He embarked as part of the 13th Reinforcements, 24th Battalion, from Melbourne on board the “Themiocles” on 28 July 1916. In October he was admitted to the Fargo Military hospital in England with acne and discharged a fortnight later. He left Folkston for France on 16 November to reinforce the 2nd Division AIF. He was wounded in action at Bullecourt on 4 May 1917 with gun shot wounds to head, arms, legs, back and abdomen. He was transferred to the 5th Southern General Hospital at Portsmouth on 24 May. He returned to France in mid October. Arthur was again sick and admitted to hospital in early February 1918 and then sent to Broadwater Hospital at Ipswich with left knee synovitis in March. He returned to France in early June 1918. On 5 March 1919 he was admitted to 3rd Auxiliary Hospital with influenza. He returned to Australia on the “Armagh” in May 1919 and was discharged medically unfit on 25 June 1919 from the 3rd Military District. He received the 1914/15 Military Star, the British War Medal and the Victory Medal for his war effort. On 11 July Arthur attended a welcome home function for several local soldiers at the Tantaraboo School. Arthur married Mary Alice McFarlane in 1920. He suffered from his war injuries but continued to work in the building trade from his property at Kilmore East. He was always cheerful despite many periods in hospital. He took a keen interest in the RSL and the Kilmore Agricultural and Pastoral Society and played cricket. He served in World War 2 part time in the Volunteer Defence Corp locally for 2 years 5 months and was promoted to Corporal. Arthur died suddenly at his home on Wednesday 17 March 1954 and was interred in the Kilmore Catholic Cemetery. Arthur is honoured in the Kilmore Shire Honour Roll and the Tantaraboo State School Honour Roll. Frederick (Fred) Knight (pictured below standing) was born in June 1894 probably at Tantaraboo west of Kilmore, the fifth child of Nehemiah Knights and Alicia Jane Ann Johnston. Sometimes their surname is recorded as Knights but in his army records Fred’s name is recorded as Knight. Fred served 3 years in B Company, 15th Light Horse before volunteering in the Great War. Fred probably worked on his father’s farm and others at Tantaraboo as a labourer before enlisting on 19 November 1915 at Melbourne. After training at Royal Park, Melbourne, Fred joined the 21st Battalion in March 1917. His brothers Albert (4453) and Ralph (4455) also enlisted about the same time and joined the 21st Battalion. 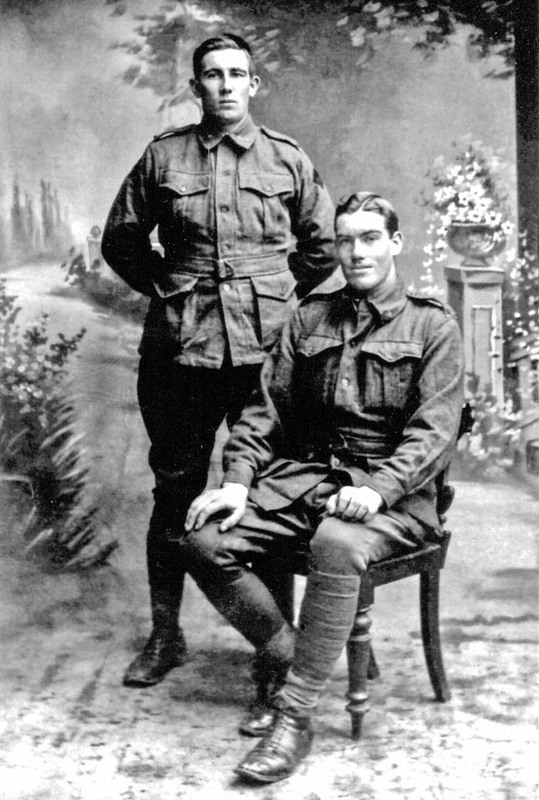 Fred’s cousin Arthur Harrington (pictured below seated) enlisted later. The 21st Battalion, 11th Reinforcements, including Fred and his brothers, left Melbourne, on the RMS Orontes on 29 March 1916 for Egypt where he first served with the Anzac Police before joining his Battalion for France. During the Second Battle of Bullecourt Fred suffered trench fever and was transferred to England. His parents were advised on 10 July 1917. After recovering Fred rejoined his battalion in Belgium in November 1917. In April 1918 Fred took part in defending the German Spring Offensive and later in the battles of Hamel, Amiens and Mont St Quentin. The 21st Battalion took part in the final Australian operation of the war at Montbrehain in October 1918 and was the last Australian battalion to be withdrawn. The 21st was then disbanded and Fred was transferred to the 5th and later took leave in England. After returning to Melbourne on the Soudan on 29 June 1919, Fred immediately travelled home the next day. He was discharged on 13 August 1919 after serving 1361 days. Fred received the British War Medal, the Victory Medal and 1914/15 Star. His name is recorded on the Shire of Kilmore Honour Roll, Kilmore Church of England Honour Roll and the Tantaraboo State School Honour Roll. After the war Fred continued working as a labourer, married Frances Alice Jamieson in 1919 and later became a milkman. He died at Rosebud in 1966.